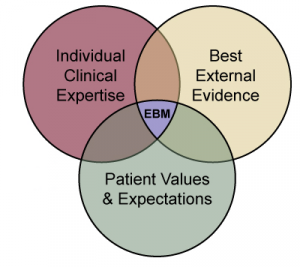 Evidence based practice (EBP) is 'the integration of best research evidence with clinical expertise and patient values' which when applied by practitioners will ultimately lead to improved patient outcome. In the original model there are three fundamental components of evidence based practice. patient values which are the unique preferences, concerns and expectations each patient brings to a clinical encounter. It is the integration of these three components that defines a clinical decision evidence-based. This integration can be effectively acheived by carrying out the five following steps of evidence based practice. One of the fundamental skills required for EBP is the asking of well-built clinical questions. By formulating an answerable question you to focus your efforts specifically on what matters. These questions are usually triggered by patient encounters which generate questions about the diagnosis, therapy, prognosis or aetiology. The second step is to find the relevant evidence. This step involves identifying search terms which will be found in your carefully constructed question from step one; selecting resources in which to perform your search such as PubMed and Cochrane Library; and formulating an effective search strategy using a combination of MESH terms and limitations of the results. It is important to be skilled in critical appraisal so that you can further filter out studies that may seem interesting but are weak. Use a simple critical appraisal method that will answer these questions: What question did the study address? Were the methods valid? What are the results? How do the results apply to your practice? Individual clinical decisions can then be made by combining the best available evidence with your clinical expertise and your patients values. These clinical decisions should then be implemented into your practice which can then be justified as evidence based. The final step in the process is to evaluate the effectiveness and efficacy of your decision in direct relation to your patient. Was the application of the new information effective? Should this new information continue to be applied to practice? How could any of the 5 processes involved in the clinical decision making process be improved the next time a question is asked? Step 0: Cultivate a spirit of inquiry - without this spirit of inquiry the next steps of the EBP process are not likely to happen. Step 6: Disseminate EBP results - Clinicians can achieve wonderful outcomes for their patients through EBP, but they often fail to share their experiences with colleagues and their own or other health care organisations. This leads to needless duplication of effort, and perpetuates clinical approaches that are not evidence based. Among ways to disseminate successful initiatives are EBP rounds in your institution, presentations at local, regional, and national conferences, reports in peer-reviewed journals or professional newsletters and publications for general audiences and writing findings in Physiopedia!! This is a talk by LJ Lee and Roger Kerry, who are both physiotherapists. This talk was presented as a Focused Symposium at the International Federation of Orthopaedic Manipulative Physical Therapists (IFOMPT) 2012 conference in Quebec City, Canada on 4th October 2012. LJ and Roger explore and challenge the notion of evidence based practice (EBP) since its introduction into health care over 20 years ago. The evidence for EBP is investigated, and the role of clinical experience and expertise is analysed. This short overview article by World Confederation of Physical Therapy (WCPT) addresses the issue of EBP. Making better use of research findings. Andy Haines and Anna Donald. BMJ. 1998 Jul 4; 317(7150): 72–75. Finding information on clinical effectiveness. Julie Glanville, Margaret Haines, and Ione Auston. BMJ. 1998 Jul 18; 317(7152): 200–203. Barriers and bridges to evidence based clinical practice. Brian Haynes and Andy Haines. BMJ. 1998 Jul 25; 317(7153): 273–276. Using research findings in clinical practice. Sharon Straus and Dave Sackett. BMJ. 1998 Aug 1; 317(7154): 339–342. Closing the gap between research and practice: an overview of systematic reviews of interventions to promote the implementation of research findings. Lisa A Bero, Roberto Grilli, Jeremy M Grimshaw, Emma Harvey, Andrew D Oxman, and Mary Ann Thomson. BMJ. 1998 Aug 15; 317(7156): 465–468. Implementing research findings in developing countries. Paul Garner, Rajendra Kale, Rumona Dickson, Tony Dans, and Rodrigo Salinas. BMJ. 1998 Aug 22; 317(7157): 531–535. ↑ Trisha Greenhalgh, Jeremy Howick, and Neal Maskrey. Evidence based medicine: a movement in crisis? BMJ. 2014; 348: g3725.